I consider myself to be somewhat of a boiled-egg expert. After all, boiled eggs and soldiers as breakfast in bed for Mum and Dad was the first meal I attempted, aged eight. Not a great success as I recall, but in this season for outstanding eggs, there is nothing more comforting and homely than a plate of boiled eggs and soldiers and so I find myself as enthralled by its eloquent simplicity now as I was when I was a small child. Over time I have realised that my favourite way to serve this dish is in the form of a perfectly boiled goose egg with first of the season English asparagus soldiers. This recipe is really straightforward, and if it’s a twist on the traditional that you’re after, this is for you. 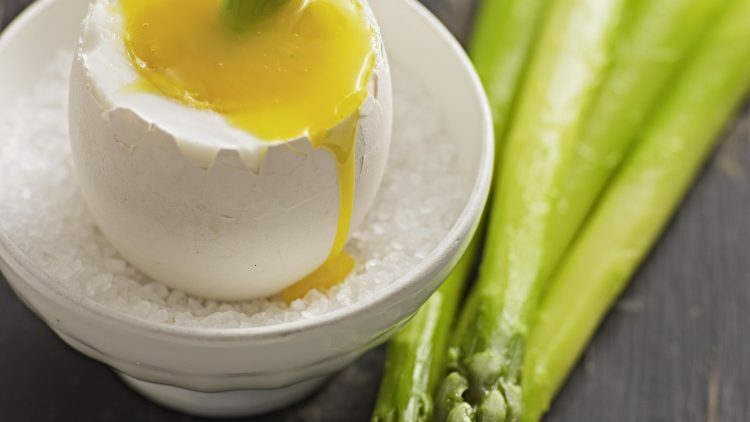 Goose eggs are rich, creamy and filling and I can assure you that one is enough with the crunchy, green, lightly salted asparagus. We also tend to use duck eggs a lot in the restaurants, and they are a real treat to have at home. Fried, poached, baked, or scrambled, they are always a popular choice in my house, and if you have friends round for Saturday brunch they are the perfect way to lift an otherwise ordinary meal. For a rich and decadent version of a fried duck egg, try serving it with shaved summer truffles, punctuated with a few thyme leaves and finished simply with sea salt and freshly ground pepper. This flavourful, yet stripped-down rendition allows the main ingredients to shine through – and of course, eggs and truffles are a match made in heaven! Here are my tips on how to soft boil a whole variety of eggs that I hope will inspire you to experiment with the abundance of eggs that seem so right in early spring.